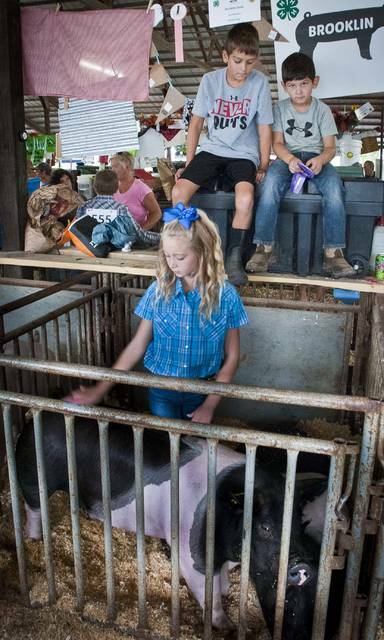 Getting a bird’s eye view of their cousin Brooklin Davis as she brushes her hog for the Champion Drive is Kase Tidd, left, and Kolton Tidd. The boys were taking note of her technique for when they start showing hogs in the years to come. 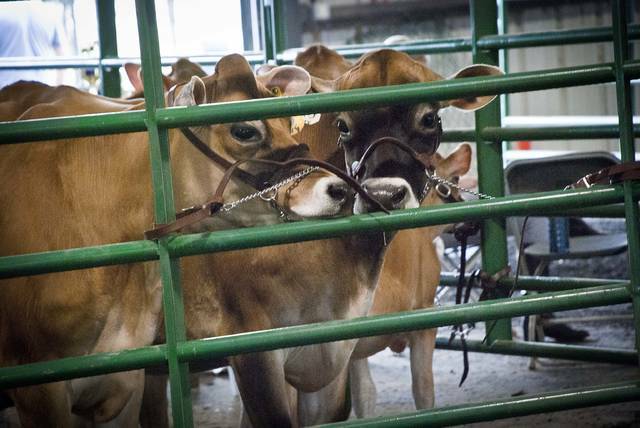 These two fine ladies waited patiently Monday morning to be judged in the Fall Heifer Class. 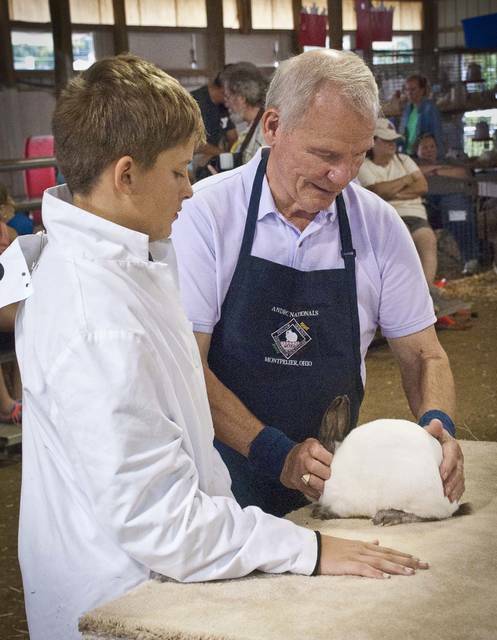 Judge Glen Carr, right, has been judging rabbits for 53 years and is the oldest judge in the area. 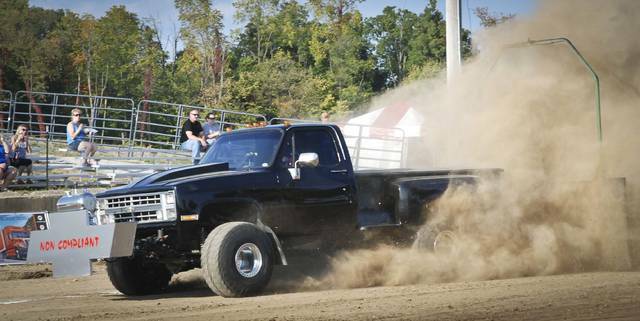 Carr is telling Christian Takatch what he looks for in a champion Dutch Rabbit. 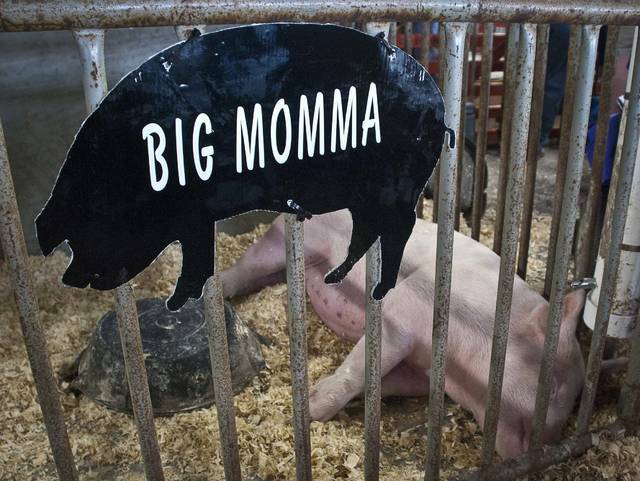 Big Momma was getting her beauty rest before she had to perform in the ring. The noise from the crowd didn’t seem to bother her in the least. The apple doesn’t fall far from the tree. 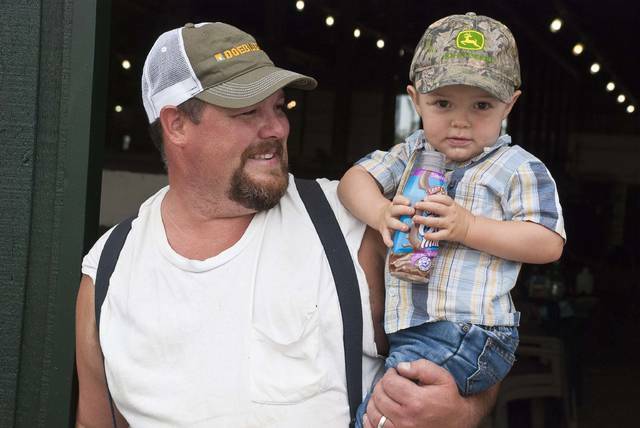 Chris Bradek took his son Henry out to look around the Delaware County Fair and to stretch their legs and get a little fresh air. 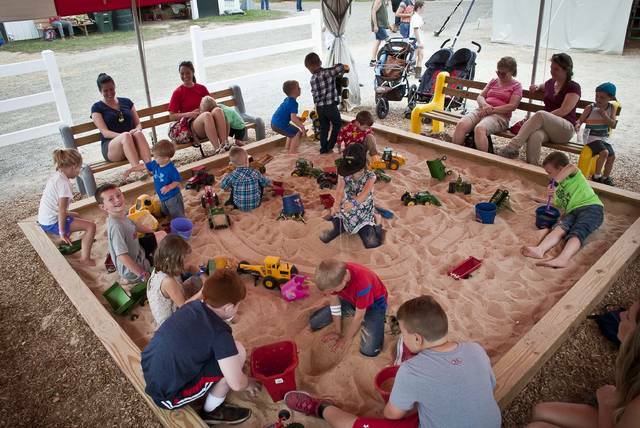 Parents appreciate the large sandbox for the kids to play in while they sit in the shade and get off their own feet for a spell. 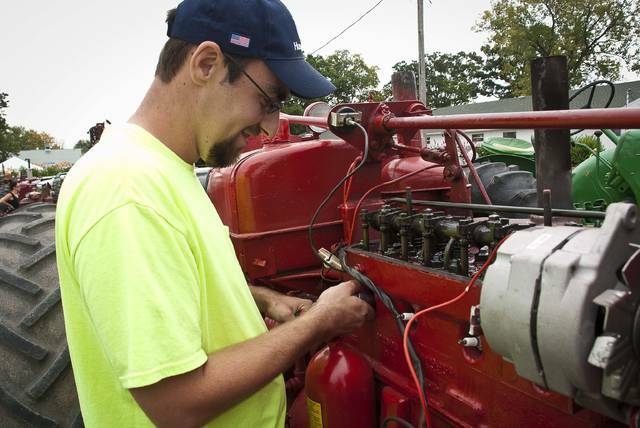 Clayton Hill replaces the spark plugs in the old Farmall tractor that was proudly displayed among the other retired tractors. 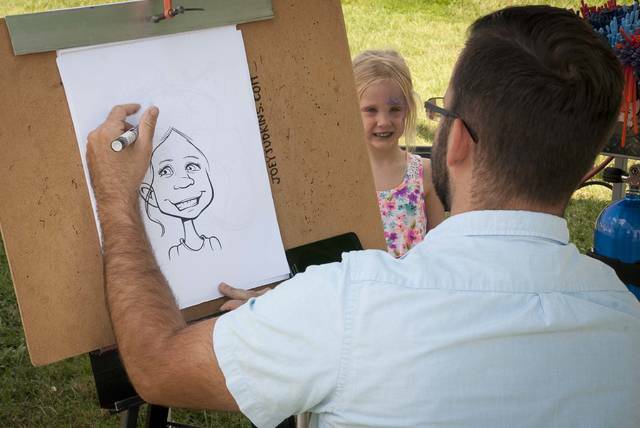 Evelyn Tyson showed her best smile to Joey Judkins as he drew her caricature. DinosaurXperience was one of the live action figures walking the Delaware County Fairgrounds on Sunday for children to see. 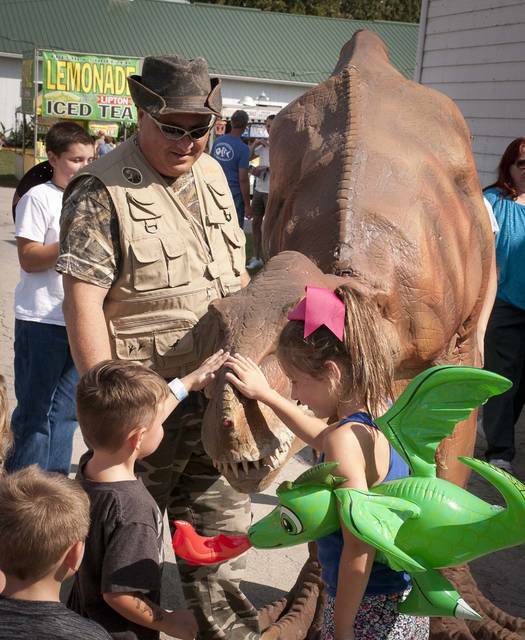 The not-so-scary dino loved being petted and having his picture taken with the kids. Corralling turkeys isn’t always as easy or as fun as it looks. Issak Williams was helping his friend get his turkey Sparky back to his pen. 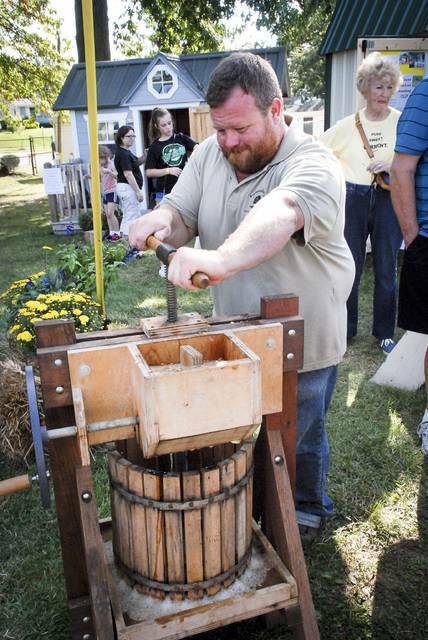 Pressing apples to get every drop of golden juice takes a great amount of strength as Gabe Ross displays by the look on his face as he turns the handle of the press. 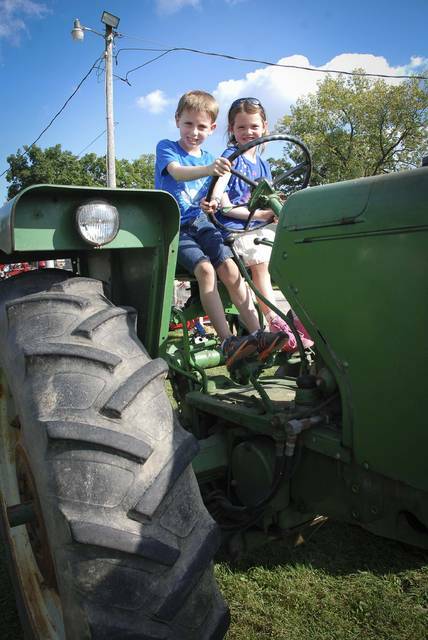 Sitting on the seat of an old Oliver tractor, Alex and Danielle Yaussy wonder what it was like to plow the field in the open seat without the air conditioned cab. 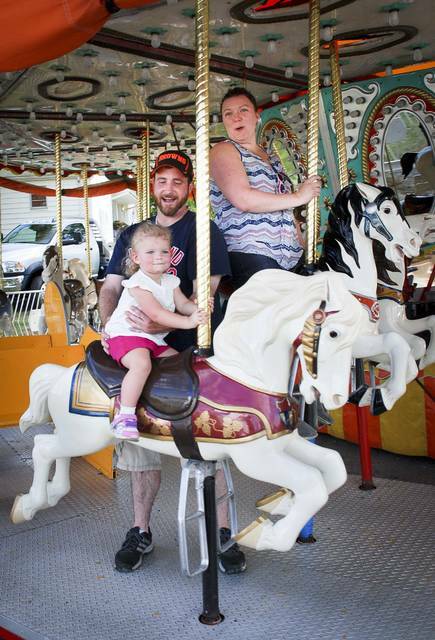 Erica and Aaron Brown thought it was time for young Lydia to take a spin on her first merry-go-round. Lydia looks like she loved every moment of it. 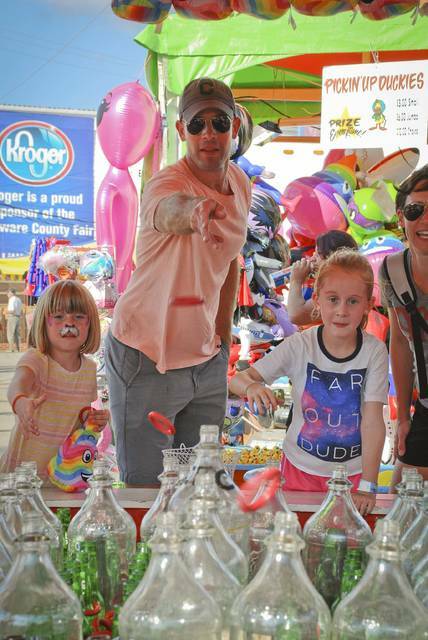 Trying to win the big prize at the ring toss was the goal for Sarah, Mick, and Layla Pfaff. The truck pull kicked up so much dust Sunday evening that it essentially created a new farm field down the road. 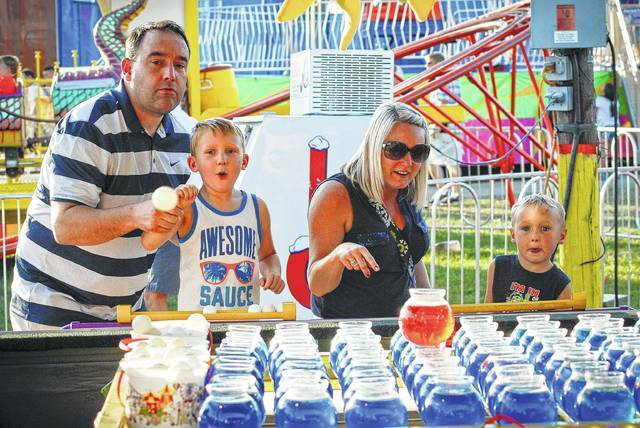 Scott and Tanya Willis found themselves teaching their sons the importance of softly tossing a ping pong ball to win a goldfish. Cooper and Brody watched each toss in hopes of winning one of the stuffed goldfish.